Born on the North Side of Chicago, Ron DiCianni grew up in an unlikely area to produce a talented artist. After attending the American Academy of Art in Chicago, Ron embarked on a career in commercial illustration. Quickly recognized as one of the nation’s most talented illustrators, Ron’s client list was soon dominated by prominent companies ranging from Eli Lilly™ to McDonald’s™. He was chosen as the 1980 Official Olympic illustrator and considered one of the most successful illustrators of his generation. One passion still overshadowed that success… the desire to Reclaim the Arts for Christ. However Ron had been repeatedly frustrated by the feeling that the Church was not yet ready to re-incorporate visual art back into its presentation of the Gospel. But in 1989 the time was right and God led Ron to create the painting that started a revolution… Spiritual Warfare. Several incredible Christian paintings followed on the heels of Spiritual Warfare and it was soon clear that a new chapter in art had begun. In a world dominated by the visual realm, Ron DiCianni considers himself “a Christian cleverly disguised as an artist.” His self-stated mission is to “Reclaim the Arts for Christ” and he has taken on the role of a pioneer in what has quickly become a second Renaissance. With numerous awards for both his work as an author and as an artist, the response from the Christian and secular markets continues to be overwhelmingly positive. Honored with the R.H. Love and Visitor’s Choice Award for multiple years at the Sacred Arts Show, Ron’s art continues to blaze a new trail. In 1999 a major secular art magazine considered Ron’s painting Safely Home to be among the top 50 paintings of the year worldwide. No stranger to the book industry, Ron has collaborated on over 50 book projects and is a seven-time winner of the Gold Medallion Award for Excellence in Christian Literature. These projects have generated multiple millions in sales and been translated into languages all over the globe. Working closely with names like Max Lucado, Joni Earckson-Tada, Jerry Jenkins, Randy Alcorn, Frank Peretti and Michael Card has provided Ron the opportunity to blend his artistic talent with that of world-class authors. Equally talented with brush or pen, Ron has written almost a dozen books of his own, many of which continue to win praise as some of the finest of their kind. Ron is also the creator of the long standing & bestselling Tell Me Series. Recently commissioned to do a series of murals on the essential truths of Christianity by one of the world’s largest denominations, these four new pieces form the cornerstone of the upcoming worldwide We Believe Campaign. Last year, Ron unveiled the long awaited Resurrection Mural, a two year endeavor that produced a 12 foot x 40 foot mural that is the largest known contemporary depiction of Christ’s Resurrection in the world. The Resurrection Mural was just selected by the prestigious ARC as one of the world’s top 100 pieces of Fine Art. This year, Ron is proud to debut a powerful new pro-life painting entitled Before I Formed You in the Womb, that has in-turn launched a new non-profit foundation. 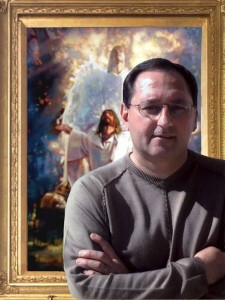 What began with one painting twenty-five years ago God has used to create a whole market for Christian art products ranging from fine art reproductions to books and a wide variety of derivative product. This synthesis of fine art and a Christian message has led Ron, by God’s grace, to realize a vision formed decades ago in art school. Ron DiCianni currently lives in Southern California with his wife Pat. They consider their two greatest works of art to be their children, Grant and Warren and they are proud to announce the addition of grandchildren: Nicolas, Catelyn, Claire, Hudson Taylor, Rebekah, and Finn.